Fall phlox 'Summer candy' (Phlox paniculata 'Sweet Summer Candy'): growing, planting, caring. A cultivar with pink flowers with a white center. 'Sweet Summer Candy' is a compact, upright phlox, with broadly lance-shaped, dark green leaves and dense panicles of tubular, white-marked bright pink flowers from midsummer to early autumn. Phlox are perennial or annual herbaceous plants of the Polemoniaceae family belonging to the Phlox genus - from the Greek "flame", surely for the bright color of the flowers! They grow branched stems, 80 cm to 1.20 m, stiff and brittle, with many lanceolate leaves. Depending on the variety and cultivar, the bloom lasts from early summer to the middle of the fall. The colors vary from shades of pink, red, mauve, to blue or white. In the spring, you will find buckets in garden shops. Choose plants with healthy, well-erected foliage, with no whitish or brown powdery patches that would indicate disease. 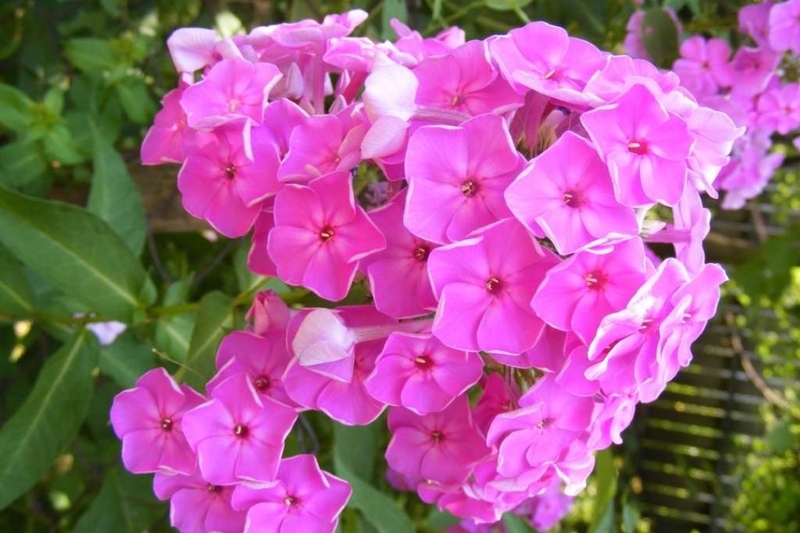 Plant phlox in fertile, drained, acid-prone soil, in the sun or in partial shade. Be careful though: if the phlox tolerates a limited exposure, some varieties are very sensitive to powdery mildew. Dig holes the width of the root ball, ideally add a bit of heathsoil and some ripe compost. Keep 40 cm between each plants, because the phlox is a perennial that grows quite fast! Water copiously to improve the recovery. Water regularly, especially young plants until the first signs of recovery. In summer, the soil must remain cool throughout the season. Be careful, phlox are sensitive to powdery mildew, absolutely avoid spraying the foliage! The phlox tends to bend sometimes under the weight of its flowers! Stutter the big varieties, especially if your phlox is exposed to the winds! Their stiff stems could break. A compost mulch, in early summer, will help the phlox to keep freshness without increasing the risk of powdery mildew, but you should monitor the leaves often anyway! Cutting or tuft division? After 4 years, you can divide the tuft, to give it a new breath. Do this at the end of the fall, after the flowering. Root cutting is another easy method to succeed and ideal for getting new feet. Operate in November-December in mild weather. Carefully discover the roots of a tuft with a fork. Properly remove the soil by hand before cutting 3 to 5 cm long pieces with a sharp knife. They must wear fine rootlets. Fill half a box, with a mixture of half sand and half potting soil. Lay the sections flat, without touching each other. Cover with the same mixture and moisten with the spray. Place the box under shelter. In March, plant the sprouted roots in your flowerbeds. You can trim the clump after its flowering, but beware: for the perennial ones blooming towards the end of the summer - this is the case of phlox! - it will be necessary to do a light pruning, which will increase the quantity of flowers to come, by delaying the date of flowering. It involves cutting with garden scissors or pinching with the nails the end of the young stems to promote their branching, that is to say the formation of new flowering shoots. These cuts also strengthen the vigor of the plants, thus, by becoming more robust, they will no longer need to be supported by stakes. Pay special attention the first weeks to the young shoots, especially if the weather is wet: slugs are fond of phlox seedlings! You can remove them by hand, or simply create a barrier of ashes. Subsequently, in hot and humid weather, if you notice a white felting on the leaves - bingo! It is powdery mildew. Spray it with a solution of milk - 1 volume of milk for 10 volumes of water - with a sprayer. In early spring, bring your phlox a fertilizer for flowering plants. You can also fertilize earlyer with organic materials that will decompose slowly; Spread a partially decomposed compost or well mature manure around the plants, and incorporate it on 10 cm with a claw. This should be done in winter so that the earthworms and soil bacteria have time to do their work.